One of the main qualities inherent in the sign of Scorpio - the depth of feelings. Scorpions rarely show indifference to anything or anyone, the world seems to them black and white. The reason for this is the inner passion that manifests itself in every aspect of their life, and therefore the appearance of Aquarius, who is inclined to justify and justify his feelings, is a serious test for Scorpio. While Aquarius is still too small, Scorpio shows the basic properties of his nature, creating a strong bond between himself and the child, but later Aquarius will try to weaken them, because he believes that Scorpio unceremoniously invades his inner world. Scorpio needs to moderate his own instincts, thanks to which he believes that the child belongs to him with his soul and body. Aquarius is not easy to get mad, but he is able to give Scorpio an emotional slap in the face, just shut up in himself and defiantly ignore him. 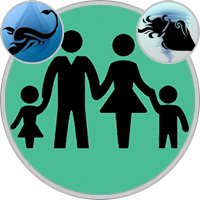 An energetic Mom-Scorpio looks at her brisk Aquarius and dreams about his wonderful future. She encourages all his many interests and is proud that he is so inquisitive and intelligent. True, a mother can make the mistake of deciding that her child must do all that she herself could not. She needs to understand that it’s important for an independent little Aquarius to find her own way in life. The mother should not think that her child will succeed in everything that seems possible to her. It is better for him to study those subjects where he will be able to show himself, and this will only be if he is given freedom of choice. This mother does not need to choose for the child, what he considers a favorite occupation, do not interfere with his relations with friends or unnecessarily restrict it. Aquarius, of course, must be controlled, but in full force, it will manifest itself only if it feels free. The trouble is that Scorpio Mom believes that without her intervention, everything will go at random. But maybe she will calm down, making sure that her logic-led child has a head on his shoulders, and is clever, so he will not do anything stupid. Aquarius, of course, needs to be taught the rules of behavior, but he also argues, trying to do everything in his own way. Do not unceremoniously pull him down - just talk to him, clearly defining your requirements. Playing a psychological game with Aquarius is also not worth it: he is much more straightforward than his Scorpion mother, and all these secret maneuvers are not in his style at all. None of them is disposed to open their feelings to others, however, for various reasons. Aquarius is not very emotional, but is afraid to become uninteresting if it is too understandable. Scorpio is afraid to lose the reins if he discovers his true feelings. This mother claims to be the commander-in-chief, and therefore skillfully holds back those emotions that seem to her superfluous. What she really needs to learn is the ability not to interfere with her child being herself. And be sure - he will appreciate it! Aquarius adores his father, Scorpio, because he is so powerful, strong and intelligent! But this child is ready to defend his rights, if Scorpio begins to command. Father is sure that everyone in the house is obliged to obey him, and even more so. But Aquarius, stubborn and controversial, does not want to give up so easily to his father. Scorpio will have to become more flexible - or there will always be quarrels between them. Aquarius is not ready to be restricted in anything, and simply does not understand how his father can think that freedom is necessarily fraught with trouble! Well, if the father is too rigidly to insist on his own, he can simply crush the child in his creativity and his ability to spontaneously make smart decisions. This child does not need a framework that prevents him from thinking freely, using his imagination and creativity. If Scorpio thinks mostly about his own needs, looking for ways to achieve his goals, the ideas of his Aquarius child can benefit the whole of humanity. Optimistic Aquarius wants to change the world for the better and will be deeply distressed if the father tries to stop him. Scorpio’s father has a difficult life, and sometimes there are so many dark intrigues in it that it’s better for a child to stay away from it. But there is also the possibility that Scorpio will prove to be a loving father who is not right only in one: inability to understand why his child wants to live his own life, so unlike the life of his parent. Aquarius is definitely more friendly than Scorpio, who, perhaps, is able to be frank, but only in his own interests. He is suspicious of the independent judgments of Aquarius and tries to control everything. Scorpio does not like the thrust of a child with adventures, especially if it is associated with risk, but he is proud of his quick mind and certainly the ability to so easily converge with a variety of people. Scorpio’s father may not have enough flexibility, and he can not understand until the end of his Aquarius child, but he wants only good for him-there’s no doubt about it.